Provide mainly online plans, completely tailor-made, in line with your level, your time available to train, your race plans for the season. Answer all your questions, however trivial they may sound. Insist on the importance of stress management and listening to oneself. Work mainly with triathletes, road runners, trailers, cyclists, endurance swimmers, but also cater to specific needs (swimrun, Everesting). I also work with 'less fit' people through the corporate programs I have designed. 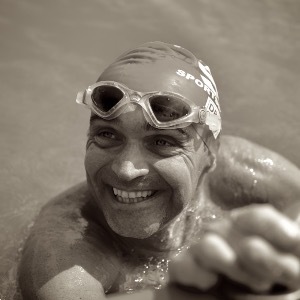 Myself a very competitive triathlete (4x Ironman World Championship finisher 2001, 2002, 2011, 2017) and ultra-endurance athlete in general (80k swim event, Ultra Trail 100 miles, Everesting, Swimrun races), I did my most spectacular sports feats while working full time as an international banker and a father of two. As such, I am one of the rare coaches who fully understand what it is to work under stress and still want to compete... without losing your job or destroying your marriage. After years of informal coaching and hard training while being a top executive, I left the banking environment, did a Master's in Sport Management and started my own coaching business in 2014: BEYOND THE LINE. I am a very structured person when it comes to planning (applying Joe Friel's principles) but I also understand the imperatives of life. I am always looking for the edge and I am open to new trends, while remaining down-to-Earth. I have a holistic approach to endurance sport, tackling stress management, nutrition, strength and conditioning, mental strength, on top of the usual aspects that you may expect. I welcome everybody as long as they are self-motivated and respectful, believe in hard work and have a positive attitude. BEYOND THE LINE is about helping you reach the finish line, making sure you enjoy the process that leads you to that line and providing personal fulfilment that will stay with you after that. I welcome all kinds of level, as long as the athlete is motivated. I get along well with busy executives as I fully understand their way of living. Success. Coach Olivier Baillet has been notified of your message.